The obverse of the silver bullion coin features an African elephant walking through the plains of Africa. Painted along the edge of this coin are the series’ title “African Wildlife”, the animal’s name “Elephant” and the silver coin’s 1 troy ounce weight, precious metal content and fine silver bullion 9999 purity. The reverse of the silver coin is the Somalian Coat of Arms as a symbol of national pride, the year of mintage, country of origin and the legal tender face value. Why buy Silver Elephant Coins from Kitco? 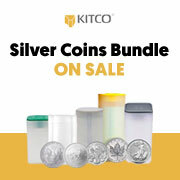 Kitco is a highly trusted leader in the silver bullion coin and physical precious metals industry. Silver Somali Coins and other physical precious metal products offered at Kitco are traded in silver bullion coin and physical precious metal markets around the world. With our focus on silver coins and silver bullion products, you can benefit from our low silver coin prices within the silver bullion industry. We strive to make it easy for you to manage your tangible wealth. You can sell or buy silver bullion coins and other physical precious metals using our convenient online store, or by contacting our team of highly trained precious metal specialists. Backed by our global information network, Kitco has proudly served our customers since 1977. The Somalian Silver Elephant Coin(s) you receive may not be in absolute flawless mint condition.